Have you ever lamented your inability to slaughter cows or grow magic mushrooms in Farmville? 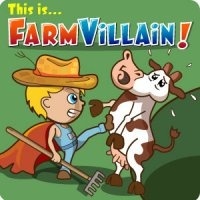 Welcome to FarmVillain, Farmville's evil (and much more amusing) twin. So, it's not quite a Farmville clone. There are no crops to tend and no pets to monitor. Think of it more as a simple, status-spewing app of glorious revenge. For every farmer friend repeatedly spamming status updates about how they're hosting a barn raising, you can answer with a pithy comeback such as this: "All your farm are belong to us. What you say? You have no chance to harvest crop make your time. ha ha ha." Or this: "You can now train young grasshoppers on your farm." There's oodles of pop culture references - Rick Astley, The NeverEnding Story - there's even an appearance from Zombie Jesus. Is it weird that I wish this were an actual game?